← For Sale: Vacation Property For The Large Group or Family! 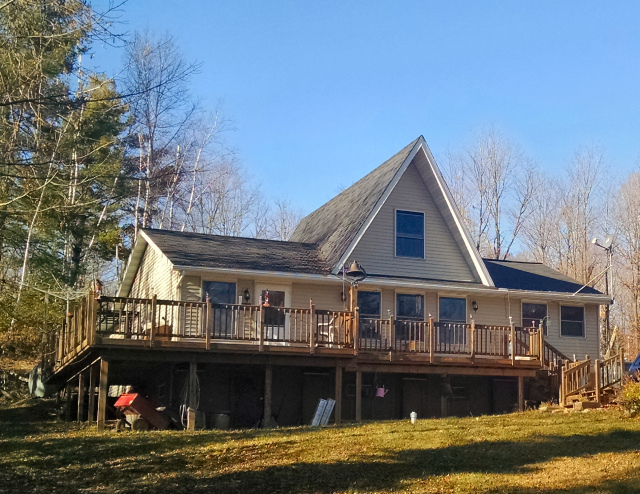 Come and see this great 4-season home located on scenic Moose Lake, east of Hayward. This was an original cabin in the Big Wolf Island plat, which the family remodeled into a 4-season home about 15 years ago. The original cabin was an A-frame with side room extensions to it. 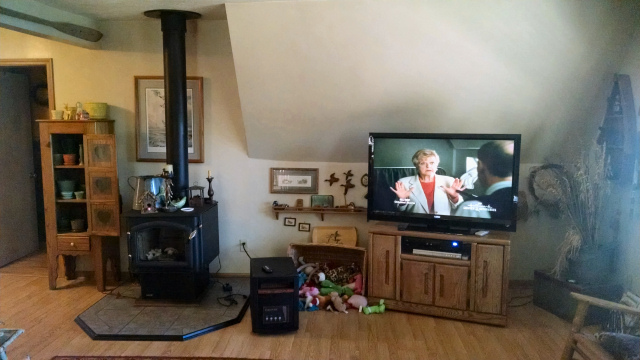 Because the family intended to live in it year round after their retirement, they installed a ceiling in the livingroom, blocking off the A-frame upper section – they didn’t want to heat all that space. The upper section remains, ready for you to finish off, and is accessible from the drop down stairway in the hallway. 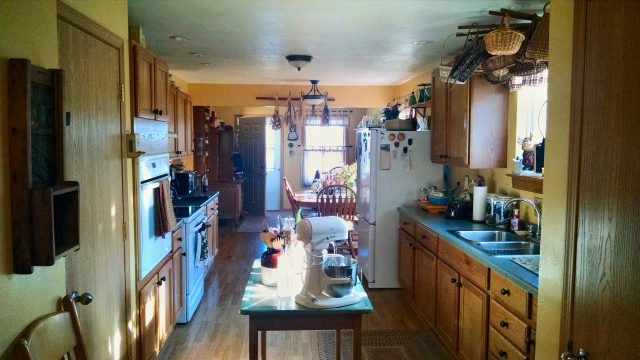 I absolutely love the sunny kitchen area, and what I mean by ‘area’ is that it is huge! 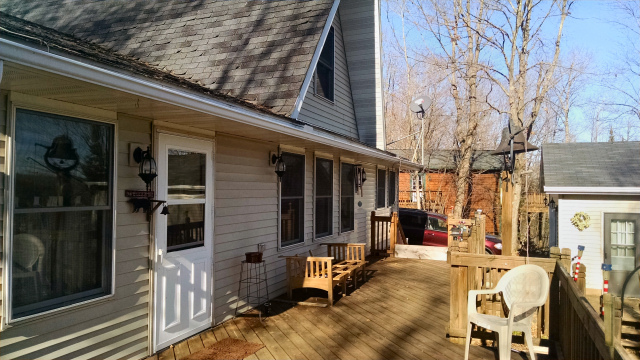 There is an entry into the home from the lakeside deck; once inside, this room spans the entire length of the home and has an entry area, dining, kitchen, and finally a laundry/pantry at the rear with a door that leads to the back deck. All is very nicely done, with laminate flooring, beautiful cabinets and green counters, nice appliances and plenty of sunlight! 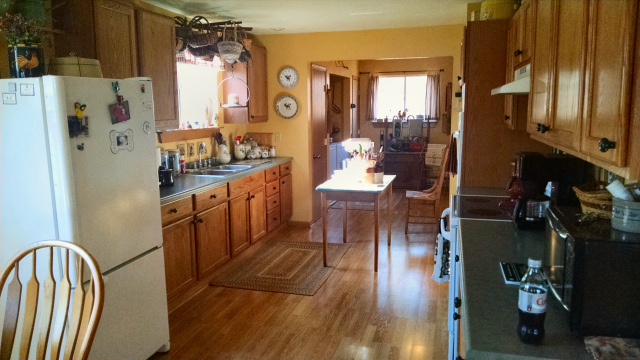 The livingarea is next to the kitchen and has a wall of lakeview windows, plus a wood burning stove for northwoods ambience on those chilly winter nights! Behind the livingroom is a large, wide hall that houses the entrances to the three bedrooms and single bathroom. The master bedroom is very spacious plus has a nice lakeview. 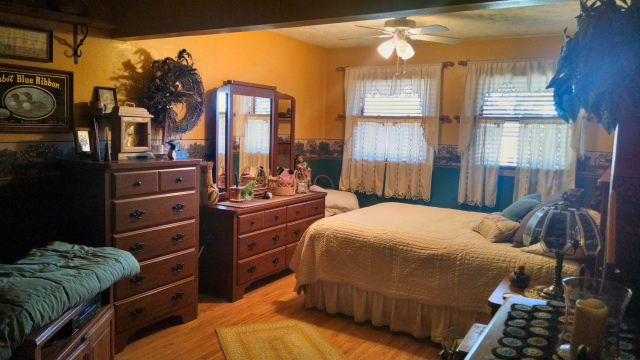 The other two bedrooms are facing the rear of the home with the 3/4 bath in between them. All flooring throughout is laminate, and all walls are painted drywall. This home doesn’t have as much of the ‘wood’ northwoods flair some expect, but it wouldn’t take much to accent some of the walls to make it into your northwoods looking retreat. Under the home is a crawl space; the first section is large enough to stand up in and the seller has it set up as a storage area. The remaining sections show the block foundation to be well-insulated and the last section houses the well pressure tank. There is a two car garage next to the home, for your autos or for boat storage. The seller enjoyed working with wood during his retirement which is evidenced by the extensive wood decks surrounding the home and garage. The yard gently slopes down to the private peninsula of this property – there is an awesome sandy beach frontage along the whole shoreline here. The plat map shows a straight line measurement of 110′ of frontage but there is a lot more since it curves up and around the peninsula and meanders back to the seller’s dock area. 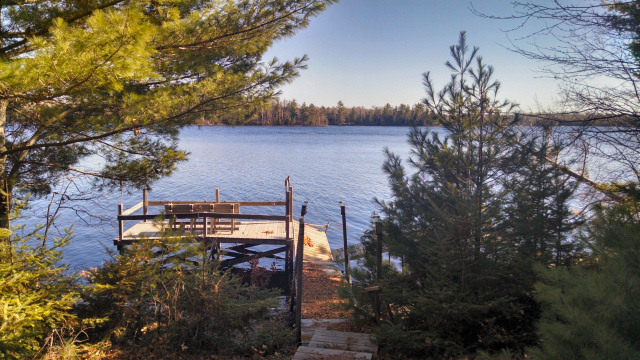 The entire view of Moose Lake is, of course, captivating! Moose Lake offers an almost ‘Canada-like’ wilderness shoreline that is breathtaking! There is also a storage shed in the yard and a nice gazebo to sit and enjoy the skyline views from! The sellers chose electric heat when they remodeled so there is no LP tank to fill, and have their own well and septic system here. 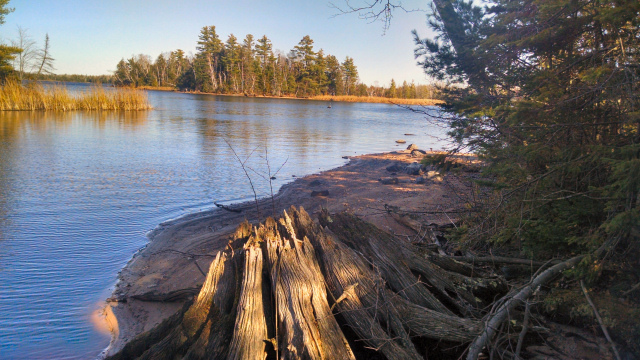 Moose Lake was created by an impoundment of the West Fork of the Chippewa River and is approximately 1,670 acres (Sportsman’s Fishing Guide) of dark brown water offering excellent fishing and scenic boating. Many snowmobile and ATV trails are nearby so you can enjoy year-round activities here! At this low price, this home will not last long – call me today to set up your personal tour of this Moose Lake gem! This entry was posted in Cabins For Sale Hayward, FEATURED PROPERTIES, Homes For Sale Hayward, on the water, waterfront cabins and tagged 4 season cabin on moose lake for sale, 4-season home for sale in hayward, 6924W Wolf Island Rd for sale, area north realty, cabin for sale hayward, cabins on moose lake for sale, cathy lareau, cathy lareau realtor, chequamegon national forest, fishing cabin for sale hayward wi, hayward wi moose lake, lakehome on moose lake for sale, moose lake cabin for sale, moose lake wi, moose lake wolf island rd for sale, muskie fishing lake cabin for sale. Bookmark the permalink.